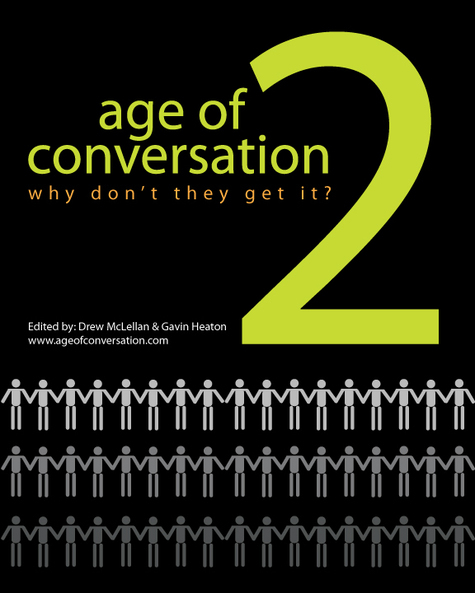 After the huge success of the co-authored Age of Conversation last year, it is back but bigger and better. This year 237 authors from 15 countries have put their minds to the subject of ‘why don’t they get it’, with each author contributing a chapter. I have written a manifesto which highlights the real distinction for me between people that understand how things work in the Age of Conversation and those that don’t. Lets say its all about control versus influence. You can order your copy here. Remembering that just as last year all the profits from sales (thats $10 for every $12.50 e-book) go to the children’s charity Variety. Last year AOC raised $15K for Variety so the aim is to beat that. Here is the AOC2 author list in full. trading control for influence is indeed awesome -i steal that bit all the time mate so thanks! In an age of conversation! [sung to wave of mutilation by the pixes] more lyrics appreciated. Struggling to post links to all 237 author’s blogs on Moveable Type 1927. I don’t mean to be mean with the link love just being slow off the mark. Neat idea for your manifesto. I also liked how the format of the entry complemented the zen-like nature of the thought. I know it’s not truly relevant to making your point, but out of curiosity, who was the very wise man who passed the thought on to you? It was a brilliant chap called James Cherkoff who runs a blog at http://www.collaboratemarketing.com/modernmarketing/. Check him out.